In a previous article, we have talked about How to remotely access your computer from your browser. Today we are going to discuss how to remotely have access to your computer from your phone. Once you establish the connection between your phone and the remote computer, you will be able to take entire control of the computer remotely using your phone’s 3G or Wi-Fi network. The LogMeIn app for iPhone/iPad and the Ignition app for Android connect to the remote computer via the LogMeIn client that needs to be kept turned on while it is being accessed. The app for iOS is available for free in the Apple Mac Store, while the Android app is a Paid App available in Google Play. The iPhone and Android apps host great features for remote access. The iPhone app has some extra features that are not available on Android. Let’s talk about some of the features here. Control your computer from your phone: You can control the remote computer from your iPhone or Android phone and have full access to your desktop remotely no matter where you are. The remote connection is set up via the internet. Remote Application Access: You can access all the applications of your computer remotely right from your smartphone. Live notifications: Get alerts and notifications from your remote computer directly on your phone as if you were right next to it. This feature is only available in the Android app. Stream in HD: With the iPhone app, you can remotely stream video and sound in HD quality. This feature is available to the Pro users only. 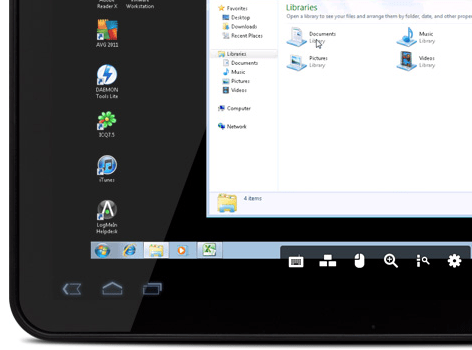 Remote File management: LogMeIn Pro users can manage files on your computer remotely through your iPhone/iPad. You can also save the files on your iPhone or iPad for offline editing and later transfer them back to the remote computer when changes have been made. Cloud Integration: The LogMeIn iOS app integrates with major cloud services like Dropbox and Google Docs so that you can even access your files in the cloud. The feature is available for the Pro users. Email Attachments: Pro users can use the LogMeIn iOS app to easily attach media files, like images and video. 1. Install LogMeIn on the client computer. Enter your credentials and activate the client for remote access. 2. Download and install the LogMeIn app on your iOS or Android device. 3. Make sure the client computer is running LogMeIn. 4. Start the LogMeIn app on your iOS or Android device and log in to your account. 5. Control the client computer remotely using your the app. Download LogMeIn for Client Computer, iOS or Android.